The LCD Reader is unique and can be configured to display images of the customers choice such as a company’s logo/name. The main visible face of the reader is a full-colour backlit LCD screen. 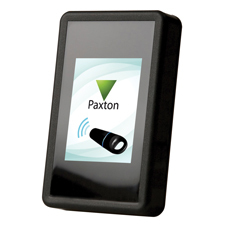 Proximity Readers read a token when the token is held within close proximity. When the token has been read the controller looks up all the access permissions of that user and either grant or denies access. If access is granted or denied then the designated image is displayed.